Would you like to join with us? As the world’s largest private provider of international scholarships, The Rotary Foundation of Rotary International helps more than 1,000 students annually to study abroad and serve as cultural ambassadors. Rotary also partners with seven prestigious universities around the world, providing opportunities to earn a master’s or doctorate degree in peace and conflict resolution. Our commitment to service is ongoing. We began our fight against polio in 1979 with a project to immunize 6 million children in the Philippines. 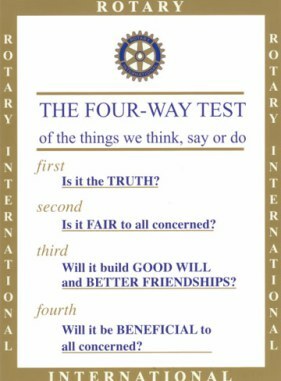 PolioPlus is Rotary’s flagship program. By the time polio is eradicated, Rotary club members will have contributed $1 Billion U.S. and countless volunteer hours to immunize more than two billion children in 122 countries. Rotary is the spearheading partner in the Global Polio Eradication Initiative, along with the World Health Organization, UNICEF, and the U.S. Center for Disease Control and Prevention. History - Founded in Chicago in 1905 the vision of one man—Paul P. Harris a Chicago attorney as the world’s first volunteer service organization. Rotary quickly expanded around the globe as a place where professionals with diverse backgrounds could exchange ideas and form meaningful, lifelong friendships. Rotary’s name came from the group’s early practice of rotating meetings among the offices of each member. Today, club members meet weekly to plan service projects discuss community and international issues, and enjoy fellowship. Clubs are nonpolitical and open to every race, culture, and creed. Are you interested in sharing your skills and experiences with other from our community? We are looking for people who walk with integrity, expertise, and a commitment to service. These are the qualities that make Rotarians extraordinary and our members find time to meet together, solve problems, exchange ideas and make lifelong friendships. Rotary brings together great minds from nearly everywhere in the world. People from all continents, cultures, and occupations—it’s truly one of our greatest strengths. Our members are leaders in their fields and communities. Our diverse perspectives help us to see problems differently—and help us solve them in communities throughout the world. Make-up at the E-Club, using the above link, if you are unable to attend a physical club meeting. Advise our Secretary to ensure your make-up is recorded. 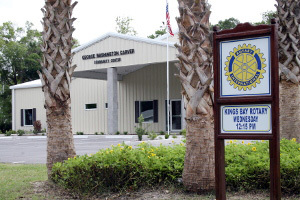 ©2016 - 2019 Kings Bay Rotary - Crystal River. All Rights Reserved.